1) (FIXED) Soldiers who are dying on the ground do not allow other units to retreat. What causes destruction the retreating troops. Screenshot. Note: The biggest problem for the RW-43 «Puphen»: In addition to the above, «Puphen» being in the building does not perform command "Only fire on vehicles". 3) (FIXED) The killing of a soldier from the squad heavy weapons stops retreat of this squad. "Retreat bug". 4) (FIXED) Another bug in the retreat: after returning to the headquarters of the OKW troops are still in in the "retreat mode" - uncontrolled. This bug is often "destroys" these units. 5) (FIXED) Heavy and medium armor coming from outside the map "City 17 - Winter" stuck outside the map and never enters the battlefield. Note: Tested was: «Jagdtiger», «King Tiger», «Tiger Ace», standard «Tiger», «Sherman», etc..
6) Half-track «sWS» (OKW): command "Hold the SHIFT key while issuing commands to queue them up to be executed one after another" does not work for half-track «sWS» (OKW). 7) Luftwaffe Supply Doctrine (Ostheer Commander) - ability "Supply Drop Zone": sound of the airplanes is missing. 8) When using some commanding abilities, associated with air-support, airplane is only displayed on the minimap, but not over the terrain. Supply Drop Zone - Cargo planes will fly over a designated Fuel or Muinitions point, dropping off resource crates that can be recovered by infantry (Ostheer). Airdropped Combat Group - Two squads of Paratroopers can be paradropped into the battlefield along with an AT Gun. These Paratroopers are deployed with a random set of equipment (USF). 9) Lightning War Doctrine (Ostheer Commander): To use the ability "Relief infantry" (Command releases reserve infantry to replace losses suffered during combat. Forces will be replaced with Ostruppen Infantry) sometimes requires the death of more than 4 soldiers. This ability does not work properly. 10) Soviet Reserve Army and Conscript Support Tactics (Soviet Commander): To use the ability "Rapid Conscription" (Any soldiers lost while Rapid Conscription is active are replaced by Conscript Infantry) sometimes requires the death of more than 6 soldiers. 11) If in the process of reinforcing squad you order them to enter the building - the process of arrival of new soldiers in the squad will be frozen. 12) At the beginning of the match, one soldier from the squad Sturmpioneers (OKW) gets stuck in sand bags. Screenshot. 13) Wehrmacht and Soviet infantry units play no battlechatter. This feature has been gone for Wehrmacht and Soviet units since the WFA-Release-Update. Note: U.S. Forces and OKW infantry units play little funny comments when the player is near those Units. 14) (FIXED) USF: Captain's ability to "On me" if you use this ability, and then squad, which is under the influence of this the ability, to place into a vehicle - this squad will keep the effect of this ability. Link & Video. 15) USF & OKW: Mostly all U.S. Forces and OKW units (infantry and vehicles/tanks) do not give a speech reply for an "Attack Move" (hotkey "A") order (on open terrain) when they are under fire (in combat). 16) (FIXED) USSR: Light tank T-70 does not use camouflage "Two Color Karelian Front. (link)" Screenshot. 17) (FIXED) USSR: "Three color Northwestern Front (link)" camouflage does not work for the light and heavy armor. Screenshot. 18) USF: US Assault Engineers and Rear Echelon troops can't work on the same munition or fuel cache. If one of them starts building it, the other can't finish it. Screenshot. 19) Ostheer: On the map "La-Gleize" a few (1-2) soldiers, after the retreat to the headquarters, are falling under the building. This bug only works for Ostheer on all starting positions. Screenshot & screenshot. Note: Has been used text of posts by "comrade_daelin" because... my English is no good. 21) USSR: Soviet Team weapons still randomly get stuck. They can't move, can't attack, can't do anything. Note 1: This bug has been found with a AT-gun ZiS-3 and a machine gun "Maxim". Note 2: This bug is randomly. 22) Wolf's Lair: Incorrectly located waypoint on the map Wolf's Lair prevents movement of armored vehicles. Video. 1) In the squad Assault Grenadiers (with MP-40) is 1 Panzer Grenadier. Thus, in the unit of 5 members only 4 are grenadiers. Screenshot. 2) (FIXED) Panzer Fusilier (OKW): no animation throw AT grenades. 3) Recruits (Soviet Army): Incorrect animation reloading weapons. Screenshot - phase 1 & Screenshot - phase 2 (by tiuq). Screenshot (by Me). 4) Panzer Fusilier (OKW), Panzer Grenadiers (Osheer), Paratroopers and Rifleman (USF): Sometimes the ability cooldown is triggered without the throwing or any explosive. It charges you for the munitions and everything, just sometimes doesn't throw the grenade. Note 1: This happens sometimes. I do not know why this happens, and under what circumstances. Note 2: This is an important bug. 5) All Factions: On the Lierneux (snow) map infantry uses non-winter skins. Screenshot. 6) USF: Support Paratroopers from "Recon Support Company" do not receive "healing" ability on reaching the 2nd level of the veterans. Screenshot. 7) USF: When the "Pathfinders" get the third veteran level, in addition they receive passive property "Camouflage". However, in the list of "veteran levels" of this unit, this property is not specified. Screenshot. 8) USF: Rflemen squad can not get re-upgrade with a flamethrower M2 ("Rifle Company" commander), if the last time flamethrower was destroyed (exploded). In this case, the improvement is considered "already completed" - but there will be no flamethrower. Screenshot. Note: If flamethrower will be lost (dropped to the ground) - upgrade can be performed again. Screenshot. 9) ALL FACTIONS: Infantry gets stuck in the dying soldiers. Screenshot. 1) (FIXED) Bipod for LMG-42: Bipod of machine gun "located", hm... here. 2) (FIXED) Ostheer: Incorrect painting / looks weapons STG-44. Screenshot. Note: This bug applies only to STG-44 for Panzer Grenadiers and Stormtrooper (Ostheer - Encirclement Doctrine). STG-44 for the Assault Pioneers (OKW) looks correct. Screenshot. 5) (FIXED) Mortar GrW.34 (Ostheer): upon reaching the third veteran level firing range of the mortar is NOT increased. 6) Howitzer B-4 and AT gun ZiS-3 uses skins for Ostheer armor. Reason: "Three Color Leningrad Front" for HEAVY vehicle. Screenshot. Note: This bug exists a very long time. 7) Howitzer B-4: Incorrect increase the firing range at the third level of the veterans. Increasing the radius of "yellow circle" has no effect on the real performance of the howitzer. 8) Upgrade LMG-34 (for Obersoldiers) does not have require "Must be in territory". 9) ALL FACTIONS: Indicators of health / strength for "Heavy Weapons Teams" (like HMGs, mortars, howitzers, AT-guns etc.) do not work correctly. Screenshot & screenshot. Get the damage to the unit of heavy weapons (for example: MG-34). Select any other unit / building / object. Re-select unit, which received damage at step №1. Health / strength of this unit is 100%. Note 2: This bug is running at 75%. SOMETIMES health-indicators are working properly. 10) OKW: Upgrade "LMG-34" now uses the icon "LMG-42." Screenshot. 1) (FIXED) MG-42 for «King Tiger»: Gun pointing in the wrong direction (fires also at an angle). Screenshot. 2) «King Tiger» does not have the coaxial MG-34 (FX, SFX, or tracers.). In-game Screenshot - Reality. 3) «King Tiger»; Pz.V «Panther» (OKW); «Command Panther»; Pz.IV Ausf.J: MG in the hull of this tanks has no rotation animation. 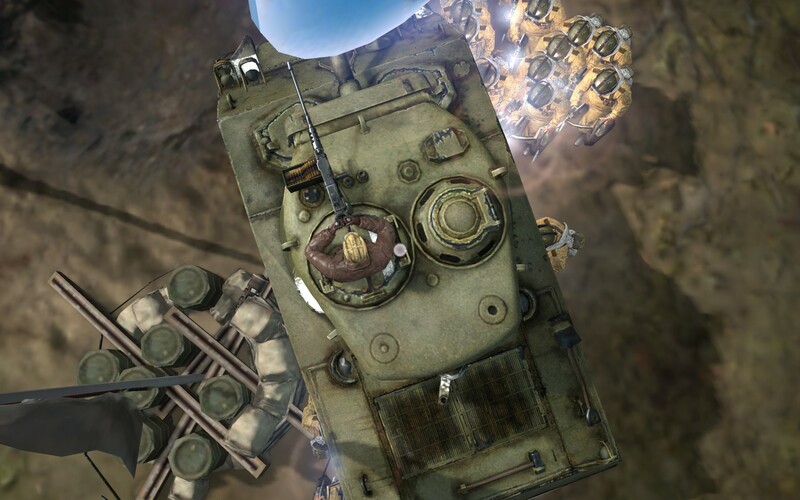 (As you can see, that's all tanks OKW) Screenshot. 4) (FIXED) Panzer VI «Tiger» tank has no animation recoil of the main gun. 5) Tank «Panther» (Ostheer): The Wehrmacht «Panther» top mounted MG-42 moves without its metal-holder while aiming at enemy targets. Screenshot(by Tigerass). Note: I want to note, that problems with heavy machine guns to tanks appeared simultaneously. Perhaps the reason for this problem, "the lack of MG" on the tank turret before the upgrade. Screenshot, screenshot & screenshot. 7)(FIXED) Commander «Panther» on the map "Lierneux (2-4)" loses its "exclusive" camouflage. Screenshot. 8) (FIXED) «Jagdtiger's» MG in the hull does not fire. 9) (FIXED) The «Jagdpanzer IV» does not receive add-on armor after reaching the second level vet. Screenshot. 10) Scout Car SdKfz.223 armed with a machine gun MG-42, but not a machine gun MG-34. Screenshot. 11) (FIXED) IS-2 rear turret MG horizontal rotation is inversed. Screenshot. 12) Sometimes above the destroyed half-track M5 (USSR) icon appears - "Restores". Screenshot. 13) All SPG from "Western Front Armies" (like Jagdpanzer IV, «Jagdtiger») have no animation horizontal rotation of the barrel of the main gun. 14) MG on the turret of the tanks (for all tanks) now disappeared prior to the upgrade. Why...? It's not pretty... Screenshot №1, screenshot №2. 15) The Wehrmacht and OKW "Sd.Kfz 234 «Puma» Armored Car" has a MG-34 as coaxial MG, but when the MG-34 is firing, the gun fire sound of a MG-42 can be heard instead. Note: The «Puma's» coaxial MG-34 should sound like a actual MG-34. 16) Machine gunner in the turret of the tank M4C «Sherman» ("Lend Liese" Soviet commander) leaves outside without opening the door. Screenshot & screenshot. 17) (FIXED) Howitzer M8A1: while firing smoke bombs the trajectory of shells does not match the slope of the main gun. Screenshot & screenshot. Note: The bug works not for every shot. 18) (FIXED) While firing 128mm. shells (ability "128mm. supporting fire"), these shells are flying in an arc, while the main weapon remains stationary. Screenshot. Note: It is likely, that this bug associated with bug №13. 19) USSR & Ostheer: the Ostheer «Puma» and Lend-Lease «Sherman» M4C can't have any camo. 20) (FIXED) Ostheer: the Hull Down ability has some problems with the updated Panzer IV, Panzer IV Ausf.F1 and Command Panzer IV. They don't get any sandbags when hulled down. Screenshot and screenshot... and screenshot. 21) USF: M7B1 «Priest»:After the shooting, if the first or second shot kills any unit - «Priest» stop fire. Note: This bug does NOT happen every time. 22) USF: M36 «Jackson» ability to "Shot Only Armour" sometimes do not work if you start to click manually to select targets. 23) USF: M8 «Greyhound» sometimes do not use canister shot, but uses its ammo. 24) Ostheer: The tank Pz.Kpfw. V «Panther» (Ostheer) uses skins for heavy tanks. Although «Panther» - medium tank. Screenshot. 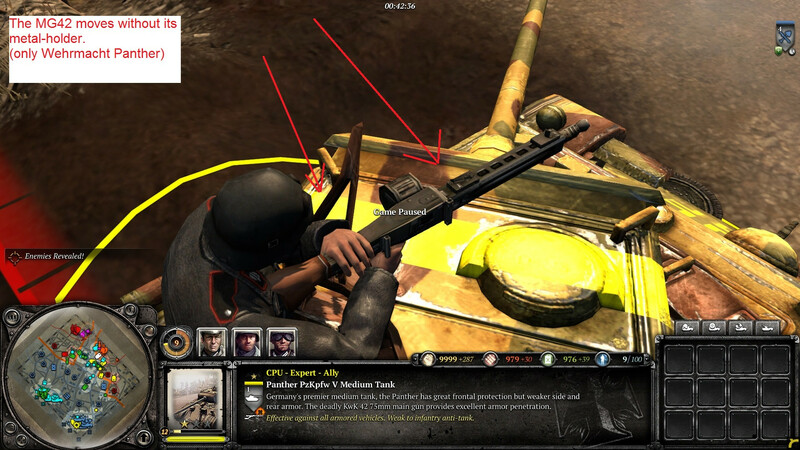 Note 1: Same bug there was for «Panther» from OKW. Note 2: Skins for Panther from OKW now working properly. Screenshot. 25) «Sturmtiger» uses skins for medium armored vehicles, although «Sturmtiger» - heavy self-propelled guns (SPG). Screenshot. Note: Info from Wiki: Click! LMG DP-28 for the squad of Soviet Guards; Screenshot. All flamethrowers for Field Engineers, Pioneers and Penal battalion. Screenshot. In the editor, "Mod Toolse" in the category "upgrade" in the properties of all flame-throwers and LMG DP-28 has an additional option: "upgrade_remove" (upgrade_bag > actions > upgrade_remove). To solve this problem you need to find line "apply_to_entities_in_squad" and opposite this write "True". That solved the problem: Screenshot. Note: But I really do not know why this option has been set. 2) OKW can not extract the fuel from the Soviet howitzer B4 and from Soviet tank «Sherman» M4C ("Lend Lease" commander). 3) All faction: "Throw Grenade" ability: Sometimes the ability cooldown is triggered without the throwing or any explosive. Note: take a look at the bug №7 - Infantry bugs. ...activation of these abilities makes an order to "Shoot armor only" null and void. M.10 - Zero-Risk Market - Capture the Lublin market squad without losing a soldier or vehicle. In the Noose - ​​​Destroy all the vehicles in the Soviet breakout convoy during the Encirclement at Smolensk. ...is incorrect. To get the achievement you have to destroy the retreating INFANTRY. Armored car M5 - screenshot. Scout car M3A1 - screenshot. ...as you can see - above listed vehicles, that can transport infantry. If you play against the AI, the screen shows the text: "Critical error. Execution terminated." (after pressing "Pause" the game continues). If you play with/against the people and use this ability - the game crash. P.S. Sorry, my English is no good. P.P.S. I want faceplate "Alpha". P.P.P.S. I want faceplate "Community Map Maker". P.P.P.P.S. I want to collect all items. Good list of bugs, I have witnessed most of them myself. P.P.P.S. We want a lot of things. You get the Alpha faceplate if you participated in it. Community faceplates have to be earned, I think only devs destribute them. I am not quite sure if it is a bug or not. If you retreat the OKW units to the fortified HQ they run back and then stand there still retreating even when they are all back, it takes ages till you can choose them again. This is very annoying if the enemy is shoting arty or throwing nades at your HQ. Would be great if we could get a comprehensive list of current bugs and forward it to Relic. Here's another new one I've seen lately in games against the AI: when a unit is garrisoned in a building, if there are wounded soldiers crawling around (i.e. "defeated" but not dead yet), the unit in the building will keep firing at the wounded soldier over and over again. You often see this with Raketenwerfers in buildings. Obviously this is annoying if the Raketenwerfer keeps firing at a wounded soldier over and over (and missing) while an enemy tank arrives. JagdPanzer IV - Frequently shooting 'diagonally' at targets instead of animating the barrel to point towards it. Tiger - No gun recoil animation. Note: Added bug №9 for the main post. Heavy armor coming from outside the map "City 17 - Winter" stuck outside the map and never enters the battlefield. Tested on: "Jagdtiger", "King Tiger", "Tiger Ace" (Maybe the standard "Tiger" too). P.S. All of the above bugs really exist. OKW Jaegar Light Infantry squads can't pick up anything, including medkits. Also Partisans no longer spawn as female. I'm pretty sure the gun recoil animations when the tiger fires is still gone. The game will sometimes try to load up commanders into your empty slots. Very annoying. 9) Heavy armor coming from outside the map "City 17 - Winter" stuck outside the map and never enters the battlefield. Tested on: «Jagdtiger», «King Tiger», «Tiger Ace» (Maybe the standard «Tiger» too). Note: Not every point reinforcements has a bug on this map. Note: Bugs №10, №11, №12 and №13 added to the list. Note: Bugs №4 & №6 fixed (i checked not all of them). Thanks Carnage, we'll make sure this gets to the dev team attention. Support Paratroopers still can't exit vehicles if they enter. The bugs № 1, 4, 5, 6, 9 and 13 fixed! The bugs № 14, 15 and 16 added to the list. P.P.S. I still want faceplates "Alpha" & 'Community"
I've sent these new reports along - thanks for being diligent, folks! Bug for the tank "IS-2" really exists. MG in the rear of the tank turret really horizontally inversion. Screenshot. Bug for "King Tiger" ... You're talking about a machine gun in the hull of the tank? If so, the flash from firing, tracers and sound effects work fine. However, the angle of rotation animation is really incorrect. "Firing angle" wider than the angle of rotation of visual animations. Rotation the machine gun is almost absent. Screenshot. In addition, I found a few bugs, which I will describe below. The bugs №17, 18, 19, 20, 21 and 22 added to the list. Bug №3 edited: Now OKW can not extract resources from only destroyed soviet howitzers B4. All flamethrowers for Field Engineers, Pioneers and Penal battalions. Screenshot. But I really do not know why this option has been set! No, I mean the coaxial MG (next to the Main Gun). The King Tiger does, in fact, have a coaxial MG weapon ("generic_mg34_coaxial_mp"), but no FX, SFX, or tracers for it. I also noticed that the T-34/ 76 doesn't have a sound and visual FX for it's coaxial MG.
P.S: No love for broken Pgrens STG 44 skin? The T-34 and IS-2 coaxial MG issues should be fixed now, actually. They were broken for a long time, though. Oh, I'm sorry. Now, I understand you. I checked again and ... "King Tiger" does not have a coaxial machine gun. Screenshot. So, a problem lies in its absence...? 1) The sound effect of a coaxial MG exists. But the visual effect ... At first I thought that the MG does not appear (Screenshot #1, screenshot #2), I tried to find the real image of tank gun. Image #1, image #2, image #3. 2) Bug "visual quality" STG-44 is already included in the list. Thank you. I keep seeing this over and over again lately--units will retreat, they'll all be back at base, but they're still in "retreat mode" for quite a while with the retreat arrow hovering over them, and they can't be selected again until they go back into normal mode. Also something weird I saw yesterday: a Fallschrimjager unit was in the process of exiting a building when a US grenade went off, destroying the building. The Fallschrimjager's icon went away and I assumed they had all died. But after a while I noticed they were still there, they just didn't have a selectable icon over them, so they were like a ghost unit. I've only seen it once but it was weird. Added "retreat bug" to "Gameplay bugs" - number 4. Thank you all, guys. But, no FX, SFX, or tracers. And FX, SFX, and tracers can use that marker in the .rgo. It's a simple fix for a problem that was present even in CoH1 for the Porsche King Tiger.